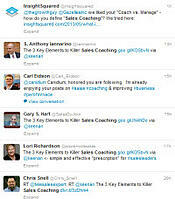 The trending topic these days is sales coaching. At the recent AA-ISP Leadership Summit, Steve Richard, Art Sobczak, and Gary Milwit all led sessions that highlighted its importance. We all nod our heads at coaching’s significance. We certainly talk about doing it. But talk, as they say, is cheap. The unkind reality is that sales leaders, senior managers, and individual contributors alike rarely give coaching the attention it deserves. According to our most recent Inside Sales research, only 14% of respondents tracked coaching time. And for those who do track, nearly 3 out of 4 are falling short of the gold standard of 3-5 hours per rep / month. I suspect many of you are nodding your heads. So we are right back where we started. We all know we need to set time aside for coaching, but what can we do to make it happen? Since 2009, Google's Matt Cutts has been embarking on 30-day challenges. The idea is actually pretty simple. Think about something you've always wanted to add to your life and try it for the next 30 days. It turns out, 30 days is just about the right amount of time. Still not convinced? Check out his TED talk Try something new for 30 days. It really works! I propose we take Matt's 30-day approach to make coaching a priority. To set you on your way, I’ve developed a Desk-to-5C Guide to launch your coaching habit ('5C' for 5 reps actively being coached). Going Desk-to-5C is a process. The entire Sales Organization can help make it happen. Take an honest look at your calendar. Do you really have to attend all those meetings? 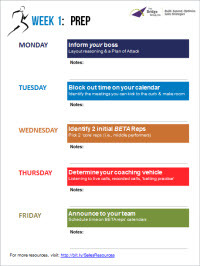 Pick 2 (low value-add) meetings a week and turn them into coaching sessions. Welcome the mentoring time and be willing to try new ideas. The recipe for improvement is experiment, try, fail, and then master. At this point I suspect you are still nodding your heads, but will you take the next step? Download the Desk-to-5C Guide to get started. And please let me know how it goes!